An artist's illustration of what the first stars in the universe may have looked like. The cosmic dark ages lasted no more than 180 million years. 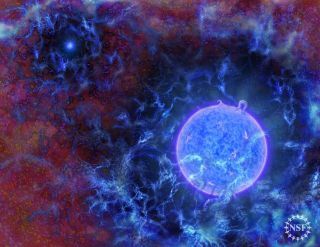 Astronomers have picked up a long-sought signal from some of the universe's first stars, determining that these pioneers were burning bright by just 180 million years after the Big Bang. "This pushes our knowledge of when and how stars formed to earlier times in the universe," said study lead author Judd Bowman, an astronomer at Arizona State University's School of Earth and Space Exploration. These very ancient stars were trailblazers. Though they coalesced from primordial hydrogen and helium, they set in motion a continuing process of star birth and death that ended up, over the eons, seeding the universe with heavy elements — the stuff that rocky planets like Earth are made of. "If you look at our cosmic origins," Bowman told Space.com, "the bottom rung of that ladder is this process of the first objects forming and enriching the medium to make everything else possible." In addition, the signal that Bowman and his team found was surprisingly strong. It was so strong, in fact, that it hints at a possible interaction between mysterious dark matter and the "normal" stuff that makes up the stars and you and me and everything else we can see in the universe. So, Bowman and his colleagues took an indirect route, searching for the fingerprints these early stars likely left on the cosmic background radiation (CMB) — the ancient light left over from the Big Bang. The stars' ultraviolet radiation, the idea goes, would excite hydrogen atoms into a different state, causing them to absorb CMB photons. Theoretically, this dip in the CMB signal should be detectable. So, the team built, calibrated and tested a radio antenna the size of a kitchen table — a project they called Experiment to Detect the Global EoR (Epoch of Reionization) Signature (EDGES), which was funded by the U.S. National Science Foundation (NSF). The EDGES ground-based radio spectrometer, at CSIRO’s Murchison Radio-astronomy Observatory in Western Australia. Then, they set the equipment up at the Murchison Radio-astronomy Observatory (MRO) in Western Australia. The MRO is in an extraordinarily radio-quiet area maintained by the Commonwealth Scientific and Industrial Research Organization, Australia's national science agency. "There is a great technical challenge to making this detection," Peter Kurczynski, the NSF program director who oversaw funding for EDGES, said in a statement. "Sources of noise can be 10,000 times brighter than the signal. It's like being in the middle of a hurricane and trying to hear the flap of a hummingbird's wing." But EDGES picked up that tiny flap, spotting a dip that's most intense at a frequency of about 78 megahertz. Hydrogen emits and absorbs radiation at a wavelength equivalent to 1,420 megahertz, so the signal EDGES detected had been "redshifted" — stretched to lower frequencies by the expansion of the universe. The extent of this redshift told the team when those CMB photons were absorbed: about 180 million years after the universe's birth. Bowman and his team reported these results today (Feb. 28), in a study published online in the journal Nature. "These researchers with a small radio antenna in the desert have seen farther than the most powerful space telescopes, opening a new window on the early universe," Kurczynski said. The EDGES signal petered out less than 100 million years later, probably because X-ray light emitted by supernovas, black holes and other objects had heated up the hydrogen atoms significantly by that point, Bowman said. A timeline of the universe, updated to show when the first stars emerged (by 180 million years after the Big Bang). The signal EDGES found was about twice as strong as the team expected. There are two possible explanations for this surprising intensity, Bowman said: Either the radio background was quite a bit stronger in those early days than scientists had thought, or the hydrogen gas was significantly cooler. The study team leans toward the second possibility, because it's tough to imagine a process that would increase the radio background to the necessary levels, Bowman said. It's also tricky to figure out what may have cooled down the hydrogen, but there is a promising contender: dark matter, the mysterious stuff that makes up 85 percent of the material universe. Dark matter neither absorbs nor emits light, making it impossible to see directly (hence the name). Astronomers have inferred the substance's existence from its gravitational effects on "normal" matter, but they don't know what dark matter actually is. Most researchers think it's made up of as-yet-undiscovered particles, hypothesized specks such as axions or weakly interacting massive particles. In a separate study in the same issue of Nature, astrophysicist Rennan Barkana, of Tel Aviv University in Israel, suggested that cold dark matter may have sucked away energy from the hydrogen gas, cooling it down. If this happened, "the dark-matter particle is no heavier than several proton masses, well below the commonly predicted mass of weakly interacting massive particles," Barkana wrote in his study. "We've been looking for so long for anything that can tell us more about what dark matter might be," Bowman said. "If this indeed gets borne out and continues to be confirmed — that the detection is real, and Rennan's hypothesis is real [and] is the best explanation — then this might well be the first key to advancing our knowledge of what dark matter really is." Speaking of confirming the detection — that's the immediate next step in this line of early universe research, Bowman said. He and his team spent about two years validating their find, ruling out all possible alternative explanations. But for the discovery to be rock-solid, another research group needs to spot the signal as well. If that happens, astronomers can mine the signal for more information, Bowman said. After all, now they know where to find it. For example, further study by sensitive radio-telescope arrays should reveal more about the nonstandard physics hinted at by the signal and more about the properties of the universe's first stars, he said. "Also, we would expect that we can eventually start to discern when the very first stars transitioned into the second-generation and later stars that were built out of gas that had heavier elements in it," Bowman said. "I think all of that then gets tied into the origin and formation of galaxies as a whole."